Balloonatic is a 1-vs.-3 minigame in Mario Party 7. The minigame's name is a portmanteau of the words "balloon" and "lunatic". 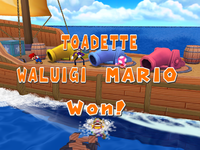 There is a similar minigame in Mario Party 9 called Blooper Barrage, except that all the players shoot cannonballs. 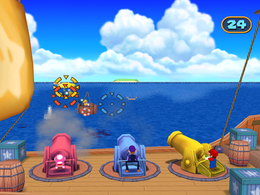 The opening clip shows the solo player flying towards the boat, while the team of three are firing their cannons at the solo player, with no cannonball actually hitting the single player. The goal of the solo player is to survive for 30 seconds the onslaught of cannonballs that are fired by the team of three. The goal of the team of three is to hit the solo player's balloons with their cannons. The solo player flies a hot-air balloon, while the team of three fire their cannons from a boat at sea. One ending of the minigame. The ending clip for the solo player shows them having landed safely on a small island (the losing team of three is not seen), and the ending animation for the team of three shows them celebrating, while the solo player is being carried off by the water. Rules – "One player flies a hot-air balloon and tries to dodge incoming fire. The other 3 attempt to bring him down!" Advice – "Move the hot-air balloon up and down as much as possible to make yourself harder to hit." Taihou de neratte! Aim by Cannons! This page was last edited on August 14, 2018, at 23:43.